Sometimes when it comes to video games, it’s best to leave well enough alone. Not every game needs a sequel, and not every series, regardless of quality, needs to be revisited. Case in point, the .hack series of games developed by CyberConnect2 and published by Bandai (prior to their merger with Namco). While the original four games in the series might have only received mediocre reviews, they struck a chord with me. I loved the highly original concept of a pseudo-MMORPG and was instantly hooked by the storyline, which involved characters being attacked by a mysterious skill called Data Drain that would actually leave the real-world player into a coma. It was fascinating stuff. Unfortunately, for whatever reason, the creative teams behind it decided to revisit the series and improve upon the initial games. They have failed miserably. 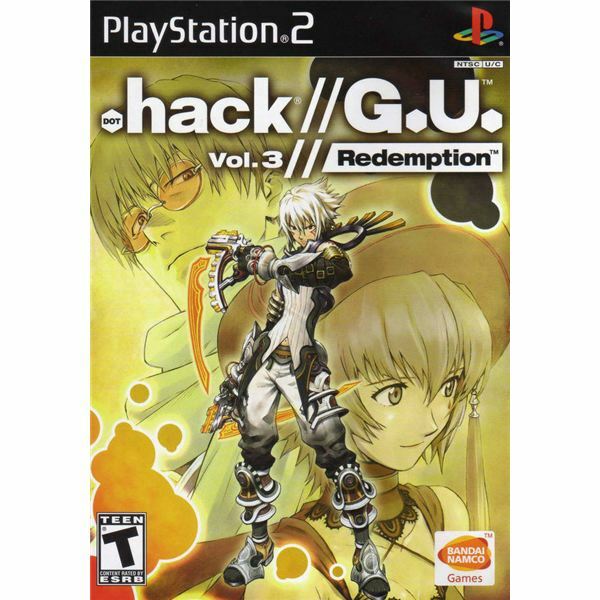 It’s impossible to review Redemption, and by proxy the entire .hack//G.U. series, without comparing it to the games that came before it. Story wise, the new series does not compare favorably to the old. In the first of the original .hack games, players assume the role of the character Kite and his creator, a player who is making his character and logging into the MMORPG known as "The World" for the first time. Thus, there is a sense of wonder and discovery as you are introduced to the environment and the game-within-the-game along with Kite’s creator. Early on, he also witnesses a close friend of his get attacked by Data Drain and thus hospitalized in real life. Thus the conflict takes on a personal nature immediately. If you ask me, that’s a good way to start a game, because it’s something the player can relate to and it helps to get them hooked right away. The .hack//G.U. series takes a different approach, however. It places you in the role of Haseo, an established character nicknamed "The Terror of Death." He is what the game refers to as a P.K.K. or a player-killer killer, which basically means he’s like an in-game sheriff, protecting weak players from predatory characters. Apparently, he became a P.K.K. because a friend of his was attacked by a rogue player and — surprise, surprise — winds up in a coma. Haseo trains, becomes high level, challenges the player who took down his friend and winds up losing. Thus, your character gets knocked back to Level 1 but you survive to tell the tale, and here the first game (and the series) begins in earnest. It’s a long and winding road filled with complicated terminology, but to break it down to the bare bones, by the start of the third game "The World" is officially a true life public menace again, while Haseo learns that an old ally was the one truly responsible for his friend’s condition, and vows to hunt him down and exact revenge for his crimes. It may sound interesting on paper, but the fact is that nothing could be further from the truth. It’s an absolute bore filled with pretentious techno-babble and enough fictional terminology to make one’s head explode. It lacks the Grandia-esque thrill of adventure and discovery that the first series had, and worse yet, the core concept itself is absolutely ludicrous. Are we, the gamers playing .hack//G.U., honestly supposed to believe that after all the trouble "The World" caused throughout the events of the first four games, that this MMORPG would not only be able to relaunch but would actually be able to once again attract players? I’m all for suspension of disbelieve, but that’s just asking too much. In real life, the company behind the game would’ve likely been sued into bankruptcy because of what happened, and even if they were able to piece together another online multiplayer roleplaying game, who on Earth would be stupid enough to play it and risk the events of the past repeating? Okay, so we’ve established that the story is absolute rubbish, but how does the game play? On the whole, it isn’t abysmal. Like in all the .hack games that preceded it, Redemption involves players working on a simulated PC, through which they can read news headlines, trade emails, visit discussion forums, and log into "The World" where they assume the role of Haseo. Once in the game, players travel to different towns, purchase items, talk to other game characters, and use warp gates to access and explore both dungeon and field levels. There are several new features exclusive to the G.U. series, including but not limited to a card game, guilds, the ability to use a motorcycle to travel, and the presence of traps in certain non-city levels. You can still trade items with just about anyone, and now through alchemy you can also enhance equipment. I’m sure I’ve left some things out, but clearly there is a lot you can do during the course of this game, which gives it excellent potential as a time waster, even if many of the activities aren’t exactly what you’d call enthralling. Veterans of the first quartet of .hack games need to understand that the combat system has been tweaked considerably. It’s still real time, but now takes place in an enclosed battle arena instead of on the wide-open field. That’s disappointing, because I enjoyed the fact that additional monsters could ambush you while you were already occupied in the fight. As a result, it feels less like a true MMORPG this time around. On the other hand, I like that you can get off a surprise first attack if you’re careful, as well as the fact that you can land some serious combos in battle. Plus, the special attacks, which are triggered by holding down R1 and pressing any of the face buttons, are pretty darn spectacular. I still think I prefer the original’s battle system, but I really can’t complain too much about Redemption’s combat engine either. As much as I enjoyed the first .hack series, I have to admit that it didn’t exactly boast great visuals, and neither does G.U. The character designs range from awkward to silly looking to just down right ugly. The environments aren’t much better, as they for the most part tend to lack detail and can get repetitive. The voice acting was absolutely hideous, which actors failing to capture the correct emotion and enunciating things in a stilted manner. Music was a bit of a disappointment as well. It wasn’t bad. In fact, I quite liked some of it, especially the two vocal numbers that opened the game, which very nearly save this category from receiving a one-star ranking. It’s just that, at the risk of sounding like a broken record, it does not compare favorably to the first series of .hack games. Some of those tunes were so memorable I can even remember and recite them note-for-note today, some five-plus years after completing the final title, Quarantine. There’s nothing of that quality to be found in hack//G.U. Vol. 3. I’ve tried really hard to find the positives in .hack//G.U. Vol. 3 Redemption. The battle system does some things right, particularly when it comes to combos. There are a lot of different minigames to play and side quests to undertake. You can customize your character by equipping different special moves, use alchemy to enhance their gear and power them up in a number of different ways. The truth is, though, that none of it helps one iota. It’s impossible to look past the boring and convoluted plot line and the paper-thin premise on which it’s based. On top of that, the graphics are dated, the character designs are goofy-looking, the environments are mostly generic and lifeless, the dungeon levels are boring, and the voice acting is quite simply cringe worthy. The truth is, I purchased this game at a department store for 97 cents, and after playing it, I want my 97 cents back. With Final Fantasy XII, Star Ocean: Till the End of Time, Kingdom Hearts and so many other excellent Playstation 2 RPGs currently on the market, there’s absolutely no reason to ever bother with this clunker of a game. Save your money and replay one of those titles instead. Trust me, you’ll be better off in the long run.